Genius is a company that is always looking for affordable ways to provide you with technology. Their latest endeavor is a small video camera. The G-Shot HD520 literally fits in the palm or your hand and shoots in high definition video. This little gizmo would be great for people on the go who don't want to drag along an expensive and larger HD camera to record things on a hike, kids sporting event, etc. MIAMI (April 27, 2009) – Genius (www.geniusnetusa.com), a brand division of KYE Systems Corp., has announced a new compact, pocket-size high-definition digital video camera that excels at capturing both high-resolution stills (at 11-megapixels) and high-definition video (at 5-megapixel in MPEG-4/H.264 format) and is light enough (under 6-ozs) and portable enough to allow users to capture activities anytime, anywhere. This easy-to-use camcorder is ideal for Summer time outings, dads-n-grads, moms on-the-go or anyone looking to capture life’s moments in brilliant color and detail. Launched today, the G-Shot HD520 is both Windows (Vista/XP/2000) and Mac (OS10 or higher) compatible and designed with a ultra-bright 2.5” LTPS LCD screen that can rotate up to 270-degrees to allow users to shoot videos from any angle or position. The G-Shot HD520 comes equipped with Face Detection to track and detect faces accurately as well as Electronic Image Stabilizers (EIS) to detect and correct hand-shaking when shooting photos. The handheld camcorder has a built-in memory of 32MB and supports additional HCSD memory up to 8GB. The G-Shot easily outputs to today’s high-resolution flat-panel televisions using the included HDMI cable for theatre-like viewing or video and photos can be easily uploaded to a computer for digital editing, archiving or sharing with friends. Additionally the Z-Lighting technology enhances brightness in low-light environments, perfect for everything from Mother’s Day gatherings in dimly-lit restaurants to Summer sunsets on the beach. The G-Shot HD520 is also capable of shooting still photos (up to 11 megapixels), listening to music, reading e-books, playing voice recordings, and it can also be used as a portable media player..
ANNAPOLIS, MD: April 28, 2009 - The Organization for Safety and Asepsis Procedures (OSAP) is providing special online resources to help dental professionals protect themselves and their patients from swine flu. The Swine Flu Resources section of the OSAP website, which can be accessed at www.osap.org, includes an overview of the disease, up-to-the-minute reports on the current outbreak, tips for prevention, and links to additional in-depth information. The site is a one-stop shop for current information on the swine flu epidemic. Dental professionals should be vigilant as this potential pandemic emerges. The OSAP website provides a quick and easy way to stay current, as the site is constantly being updated as new information is received. Links to reports and updates from the Centers for Disease Control, American Dental Association, Pan American Health Organization, World Health Organization, and even the White House Briefing Room are available for instant access to critically important information and advisories. In addition, the OSAP symposium “Infection Prevention: Spread the Word,” which is being held June 11-14, 2009 in Plano (Dallas) TX, will feature courses that address this issue. Dr. Michael Glick will present on Emerging Diseases with Special Focus on Swine Flu and Dr. Molly Newlon will present on the “6 P’s of Emergency Preparedness” in which swine flu will be covered. Dental professionals are encouraged to visit the swine flu resources section of the OSAP website frequently to stay informed. Additional information will be posted as it becomes available. OSAP is the Organization for Safety and Asepsis Procedures. Celebrating its 25th anniversary in 2009, the non-profit association is dentistry’s premier resource for infection control and safety information. Through its publications, courses, website, and worldwide collaborations, OSAP and the tax-exempt OSAP Foundation support education, research, service, and policy development to promote safety and the control of infectious diseases in dental healthcare settings worldwide. Earlier this year, Toshiba announced that they had developed a 32gb NAND flash memory chip and were working on developing production. Well, in a startling development, they have now said they will begin shipping the chips in July if all goes well. These small chips will allow tiny devices to increase their memory while not ruining the form factor. Think of tiny phones and music players with tons of memory. Those of us in healthcare are always looking for ways to improve efficiency because this helps create a more positive work flow environment and decreases the amount of time patients must wait. Devlin has come up with a nice keyboard and mouse designed just for this type of use. It can be sprayed for wiping down since it is sealed and that also means it can handle spills and other inadvertent mishaps. Devlin has designed a unique keyboard for use in the most sensitive areas of hospital and medical environments, helping to prevent the spread of infection via the keyboard. The keyboard features a patented ‘clean’ button, allowing the user to disable the keyboard during cleaning without the need to shut down the PC. The keyboard is totally sealed, with the contour of the keytops eliminating the space for dirt and infection to reside. Wipe-cleaning is made easy and effective whilst still suitable for immersion sterilising. That's right, in 9 months the App Store has delivered 1 billion downloads. Amazing! Showing the power of opening the iPhone OS to developers, Apple created an industry of programmers and then provided them a means to deliver them easily and safely. Of course for this, Apple also gets a small share of the price, but so would any store. From Apple: Applications designed for iPhone are nothing short of amazing. That’s because they leverage the groundbreaking technology in iPhone — like the Multi-Touch interface, the accelerometer, GPS, real-time 3D graphics, and 3D positional audio. Just tap into the App Store and choose from thousands of applications ready to download now. Too bad others aren't doing this same thing, but Apple has such tight integration with everything that it's simply a no-brainer. Phenomenal! According to the Washington Times, President Obama's super secure Blackberry device is only "a few months away" from being in the President's hands. As you may recall, Obama was a known Blackberry addict during his campaign and decided to be the first truly electronically connected president in history by keeping his device. Of course there were all types of security concerns regarding this so the NSA and RIM set about to make a special one. "The top-secret BlackBerry 8830 is in the final stages of development by the National Security Agency, which will soon begin checking to make sure its encryption software meets federal standards. The device could be ready for use in the next few months. Once in hand, the president will be able to send text and e-mail and make phone calls to others with the secure software loaded on their devices. Others expected to get secure BlackBerrys include top aides as well as first lady Michelle Obama." investment in the development of marketing brochures, promotional videos, and patient education materials. The ClearCorrect certification workshops are conveniently scheduled throughout the country so dentists can attend without losing valuable time in their practices. Upon completing the course, dentists are not only certified as official ClearCorrect providers, they earn eight hours of continuing education credits as well. In addition, for experienced ClearCorrect doctors seeking a fast track to certification, there are one-hour online webinars avaliable. The next webinar is scheduled for May 29th with additional dates expected. For a complete and updated schedule and to enroll online for certification workshops and webinars, please visit http://www.clearcorrect.com/doctors/becomeaprovider.html. Headquartered in Houston, Texas, ClearCorrect was founded by dentists to serve the dental and orthodontic industry by providing a superior and more affordable clear aligner system. The highly sophisticated ClearCorrect treatment delivery system and corresponding aligner products are based on years of research and clinical experience. Cutting-edge technological advances and advanced treatment expertise, coupled with comprehensive marketing and sales support, make ClearCorrect the premier clear aligner solution of choice for informed dentists and patients. The company’s modern, needs-based approach for serving doctors and patients has earned it a leadership position within the dental industry. For information about ClearCorrect, the company, and its products, visit www.clearcorrect.com or call 1-888-331-3323. I love my Tivo. DVRs in general are great, but Tivo has just enough extra features to make it a level above everyone else. Although you can get a DVR from your cable or satellite company, you owe it to yourself to check out Tivo. Now, Western Digital is making it easier to get even more use out of your Tivo. The one problem with any DVR is space. Once you fall in love with them you want to use them to store shoes you love. Unfortunately, this eats hard drive space and soon you have nowhere to put those new shows. 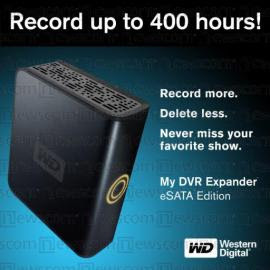 The Wester Digital My DVR Expander eSATA edition, connects directly to Tivo Series 3 or HD boxes and can increase your storage up to 1TB. The device comes in 2 sizes 500mb for $129.99and 1TB for $200. For the price, I'd take the 1TB any day. For all the info and specs, check out the product page on the website. Malvern, PA (April 20, 2009) - Along with the official launch of its recently redesigned corporate website, www.dentalez.com, DentalEZ® Group, a supplier of innovative products and services for dental health professionals worldwide, is pleased to offer dental professionals an online Operatory Color Choices resource that allows them to visualize and personally design their operatory color scheme. • Chairs and Stools – available choices include chair selection and upholstery types with over 40 color possibilities. Dental professionals can choose between Ultraleather™, Ultraleather™ Plus, Comfort-Plus, and Comfort Upholstery Colors. • Countertops – solid surface countertop designs include twelve different color patterns such as Baja Melange, Crystal Mint, and Bedrock. • Cabinet Laminates – options include a wide assortment of WILSONART-brand hues to coordinate with your countertops and office palette. • Floor and Walls – for the backdrop and floor of the operatory, dental professionals can choose from ten wall and ten floor shades that set the stage for a pleasant operatory experience. 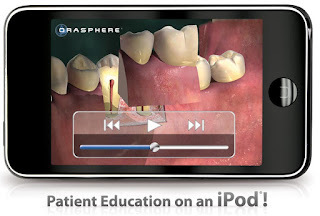 For more information and to see the new website, please visit www.dentalez.com. Could a Mac Tablet change Health Care? The device pictured above doesn't exist, it's an artist's rendition (courtesy of CrunchGear). 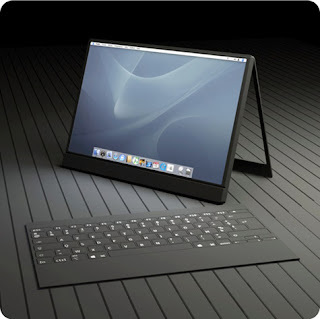 However, there are rumors that a Mac Tablet computer might be in development. Now rumors are rumors and this isn't the first time this particular rumor has made the rounds. However, myself and others think that such a device would be a great addition to the present armamentarium of devices used in the healthcare setting. Imagine a device with the ease of use of the iPhone/iPod Touch but with all the horsepower necessary to do everything a busy doctor needs. I've been a Mac fan for a few years now and I really wish I could integrate the platform completely, but alas my management system that runs my practice is a Windows only program. My buddy Houston Neal at software advice has a really nice column on this whole idea, so follow the link and see what he has to say. I think you'll find it very interesting. The new 2009 course catalog is now available for Cosmedent’s Center for Esthetic Excellence (CEE), the only center dedicated to the advancement of direct resin bonding. The CEE is limited to 15 participants so that doctors receive the individual attention necessary to drastically improve their skills with composite. Taught by a world-renowned faculty, CEE seminars are the perfect way for you to learn a fun, fast, cost-effect solution your patients can afford. All classes incorporate hands-on practice so doctors will enhance their confidence when working chairside with composite. Cosmedent’s Center for Esthetic Excellence is located in downtown Chicago, right on the river and Chicago’s Magnificent Mile. To request a 2009 course schedule call Erika Heier at the Center for Esthetic Excellence toll free: 800-837-2321, fax: 312-467-0776, or email: cee@cosmedent.com. Please also visit www.cosmedent.com for information about the CEE. I just stumbled across this device and was stunned that such a thing existed. The idea is a nitrous oxide delivery system that connects to a Nintendo Gameboy handheld gaming system. The child can play video games while waiting for the nitrous to take effect of while awaiting a hospital surgical procedure. Obviously it's easier to get adults to hold still for extended periods of time than the little ones. This allows the kids to occupy themselves while waiting. Not only is it a nice way to distract pediatric patients, it also has a pulse-oximeter within the headset as well as a capnometer to monitor respiratory rate. Geoffrey Hart, M.D. the company’s founder, recognized the need to reduce the anxiety and fear in children undergoing medical treatment. Dr Hart believed that if the hospital or dental experience for the child could be made “fun”, then appointments would take less time to complete. I have no info on price, but the company website has lots of information. If you are or someone you know is a "video gameaholic" you know how it is when a new title is about to be released. You simply can't wait to get your hands on it. The day of the release, you rush to your favorite store... (or perhaps some little hold in the wall place that no one knows about) in hopes of being able to purchase the title that everyone else is trying to grab as well. This is probably even more stressful if you're a parent dealing with a child that just has to have it. Wouldn't it be absolutely awesome if there was a way that you could guarantee that when you got to the store, the game would be available? Target has solved the problem. The Target video game reservation program will cost a dollar. For the one buck you receive a coupon that guarantees your copy will be waiting for you. But, as they say on TV, "Wait! That's not all!" The card will also be good for $5 off a future purchase. Sweet! I'm a big fan of visual patient education for years now. As of late my 2 favorites have been Guru and Orasphere. Of course the problem for some of you is getting computerized patient ed to the patient if you don't have a computer in the treatment area. For those of you facing that dilemma, Orasphere has just come to your rescue with patient ed on an iPod. Read on for details. dentists to educate their patients on the importance and value of good oral health. definite ‘wow’ factor that impresses patients, enhancing the practice’s professional image. reception area. Narrated animations can be played in English or Spanish. service plan includes technical assistance in addition to library enhancements. $1,295 and can be ordered on-line at www.orasphere.com or by calling 1-888-410-2147. Solvent free bonding agent is the next breakthrough in bonding technology. Bond-1 SF Solvent Free SE Adhesive is available in two convenient delivery systems. 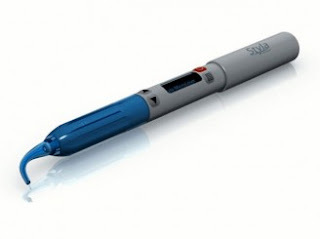 The syringe offers unique flocked needle tips that facilitate easy, direct placement into the prep, while the free standing single dose provides the ultimate in infection control. Pentron Clinical is an established leader in the dental industry, offering a wide variety of products to suit your restorative needs. As one of the pioneers of adhesive technologies, Pentron Clinical has successfully demonstrated its commitment to advancing dentistry one innovation at a time. Our portfolio of trusted, quality dental products includes: Breeze® self-adhesive resin cement, Build It® FR™ core build up material, FibreKleer® Posts, Correct Plus® impression materials and Artiste® Nano Composite. For more information visit our website, www.pentron.com , or call 203-265-7397. The good folks at ZAP! lasers have sent me a Styla Diode to evaluate. This is the smallest diode laser for dentistry currently available. It is cordless, has a cordless foot control, and puts out up to 2 Watts of power with an 810nm wavelength. It's been on the market for just a tad less than a year. It's quite an amazing little device and I have so far been impressed with the packaging. It is currently charging and I'll be using it in a variety of cases over the next few weeks. If you have questions, please comment and I'll see what I can do to answer them. The evaluation should be completed in a month or 2. One of the problems with all of our gadgets, whether it's at home or in the treatment area, is variety and sizes of all the AC plugs and adapters. 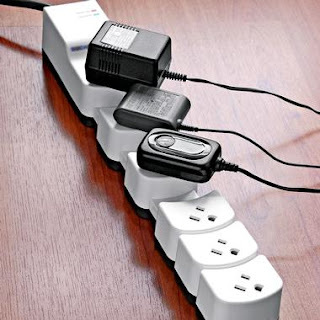 Frequently you buy a power strip with 7 or 8 outlets and then find you can only use 3 or 4 due to the size of the adapters. The Socket Sense is designed to eliminate these woes. This nifty little surge protector allows you to swivel the outlets so that no matter what you plug in, it doesn't interfere with the other outlets. This could be especially handy for those of you fighting the number of outlets in your treatment areas and looking for a small and easy solution. The device is only $29.99 and can be purchased here. Time Warner has been exploring a tiered billing service based on usage. Basically the idea is a tiered plan that is more affordable for those who don't use it much and increasing charges for who use more bandwidth. It's a system that is in use overseas and I look for other Internet providers here in the states to begin to at least explore the idea here. A 1 GB per month tier offering speeds of 768 Kbytes downstream/128 Kbytes upstream for $15 per month. Overage charges will be $2 per GB per month. TWC's usage data show that about 30 percent of its customers use less than 1 Gbyte per month, Hobbs wrote. Road Runner Lite, Basic, Standard and Turbo packages will include expanded bandwidth caps to 10, 20, 40 and 60 GB, respectively, for the same price. Overage charges will be $1 per GB per month. A new 100 GB Road Runner Turbo package will be added, offering speeds of 10 MB/1 MB for $75 per month. Overage charges will be $1 per GB per month. Overage charges will be capped at $75 per month. "That means that for $150 per month customers could have virtually unlimited usage at Turbo speeds," Hobbs added. This is an interesting idea. You'd have to really be using the service to go over 100 GB in a month, but I know of people who do. I'm not sure how this will shake out. U.S. users may complain enough that the idea disappears, but personally I have no problem with it. Users who clog the system cause the rest of us to pay for their habits. Pay to play is fine with me rather than subsidizing the heavy users ourselves. For the past several years we in dentistry have been using different types of light emitting devices to help screen our patients for the presence of oral cancer. Now a company has created a light emitting device that can make it easier for women to do self breast exams. Breastlight is a new health and well being product for women. It helps women notice any changes in their breasts over time. With Breastlight you get a new view of your breasts. Breastlight shines a harmless red light through the breast tissue so that you can see some of the details inside. That way you can get to know what’s normal for you, spot any changes and hopefully feel more confident that you’re looking after your body the way you’d like to. The product can be purchased from the company website. At approximately 1:30 a.m. Thursday morning in South San Jose, a fiber optic line was cut which resulted in loss of landline phone service, Internet, some cellular service, and 911 service in southern Santa Clara County as well as in Santa Cruz and San Benito counties. The damage was determined to have been deliberately done and AT&T is none too pleased about it. The company promptly offered a $100,000 reward for info on those responsible and then upped the bounty to $250,000 today. "We have zero tolerance for any criminal who would attack our network and harm customers," AT&T spokesman John Britton said. "We're going to aggressively work with law enforcement to see those responsible are apprehended and prosecuted to the fullest extent of the law." At this point in time, no is sure why the act was carried out, but police are investigating. I think it's safe to say that if the perpetrator's are apprehended, AT&T will be more than happy to press charges. A new company, ClearCorrect has entered the orthodontics by hard plastic aligner business. I've followed this with some interest since Align Technologies is a big player in this arena and I wasn't sure how the legal issues would shake out. It looks like all is well for a new player. For more info, read on. HOUSTON, TX--(Marketwire - April 9, 2009) - ClearCorrect, Inc., a manufacturer of FDA-cleared transparent orthodontic aligners, today filed a notice of voluntary dismissal regarding its declaratory judgment against Invisalign® manufacturer Align Technology after Align stated to the court that it has no intention of suing ClearCorrect for patent infringement. ClearCorrect filed its declaratory judgment on February 17th in the United States District Court for the Southern District of Texas, Houston Division. Specifically, ClearCorrect's original complaint alleged that certain patents owned by Align Technology (Invisalign) are invalid and that ClearCorrect's clear braces products and processes do not infringe upon those patents. "(Align) has never expressly or impliedly asserted any claim or engaged in any conduct that indicated that it believed (ClearCorrect) infringed any claim under any patent or that it would engage in any action as a result of such infringement." In addition, Align has expressly disavowed any statements of its employees that indicated Align intended to sue ClearCorrect. Align has further stated that no employee has been authorized to make such statements. Align has also represented that it has not engaged in any "scare the customer" tactics. According to ClearCorrect's attorney, Randy J. McClanahan of Houston-based law firm McClanahan, Myers and Espey, LLP, "This is a good outcome. Align has clarified that there is no black cloud of impending litigation. ClearCorrect's principals can now concentrate on growing their business. We are pleased that both parties will be able to compete fairly in this important market." "We're happy to voluntarily dismiss our suit after receiving court-filed assurances that Align has no intention to sue us for patent infringement," explained ClearCorrect CEO and practicing Houston dentist Dr. Willis Pumphrey. "We are now ready to focus on competing and aggressively marketing our product." Headquartered in Houston, Texas, ClearCorrect was founded by dentists to serve the dental and orthodontic industry by providing a superior and more affordable clear aligner system. The highly sophisticated ClearCorrect treatment delivery system and corresponding aligner products are based on years of research and clinical experience. Cutting-edge technological advances and advanced treatment expertise, coupled with comprehensive marketing and sales support, make ClearCorrect the premier clear aligner solution of choice for informed dentists and patients. The company's modern, needs-based approach for serving doctors and patients has earned it a leadership position within the dental industry. For information about ClearCorrect, the company and its products, visit www.clearcorrect.com or call 1-888-331-3323. 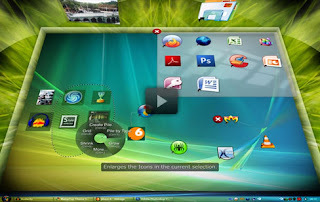 Bumptop is a pretty interesting concept that could very easily change the environment of your personal desktop. It allows you to treat things more like an actual desktop and less like a computer screen. You can stack files (just like your real desk) without creating a folder. They can then be viewed in several different modes so that you can see the files you've stacked. You can resize more important icons and they actually get "heavier". You can drag and drop photos onto Flickr and Facebook as well as files into e-mail. The micro-blogging service Twitter is continuing to pick up steam and go main stream. There are now Twittering celebrities, politicians, and sports figures. Although the initial reaction to the idea of 140 character updates was muted, the last 3-4 months have really seen it pick up interest in the mainstream media. An Arkansas judge has decided that a juror's postings to Twitter.com during a civil trial won't affect a $12.6 million judgment in the case. Lawyers say Washington County Circuit Judge Mark Lindsay on Friday dismissed an attempt to overturn a judgment against Russell Wright and Stoam Holdings, a building materials company. While Lindsay said the posts by juror Johnathan Powell were in bad taste, the messages didn't amount to improper conduct. During his jury service in February, Powell sent eight messages — or "tweets" — to the Web site, using his cell phone. One warned: "oh and nobody buy Stoam. Its bad mojo and they'll probably cease to Exist, now that their wallet is 12m lighter." Downloading movies using P2P file-sharing services, customer-initiated redirection of television or other video or audio signals via any technology from a fixed location to a mobile device, Web broadcasting, and/or for the operation of servers, telemetry devices and/or Supervisory Control and Data Acquisition devices is prohibited. What this means is the Slingbox you own and the new Slingbox ap coming to the Ap store will violate your TOS. This, of course, can allow AT&T to take action against you. Furthermore, it may keep you from watching a video posted on your friend's Facebook page or from any other site including CNN, Fox, or You Tube. It's obvious that AT&T has serious concerns about this potentially getting out of control and has decided to nip it in the bud. It's hard to predict at this point where this will end up, but it is definitely something iPhone users need to be aware of. Need a place to jot a note during treatment? OK, I know this isn't a way to get rid of paper, but overall it's a neat idea for those of you who have a need for a USB hub that you can't hide away in the treatment area. The above pictured 3 port USB hub can be written on like a white board with a dry erase marker. So if you are in the middle of a procedure and need to write a quick reminder, it won't get thrown away when your assistant cleans up after the procedure. This little gizmo will only set you back $14.99 and is a great conversation piece too. For more info, check out the gadgetforall site. Is the sun setting on Sun? When I first heard this rumor I actually smiled to myself. Ah those clever rumormongers, who thought of this one? Of course, as I always say, I'm the first to admit my mistakes and this looks like I was dead wrong on this one. According to this article in the New York Times IBM is going to purchase Sun Microsystems. These 2 companies have been rivals for most of Sun's existence and the idea of them together (especially at the current value being offered by IBM) just didn't seem possible to me. Sun has always seemed so hip to me while IBM has always been so... IBM. I remember about 12 years ago on a trip to Epcot that I got to play on a Sun workstation. It was the highlight of my trip. Although these 2 companies are huge, both are involved with the corporate market so there should be little impact on consumers. Still it's interesting that in a supposedly down economy IBM is about to pony up 7 billion dollars. If you are in need of a solution that allows you to function like a mouse, but draw like a pen, Wacom is a company you should know about. The company makes a full line of "tablets" that use a touch pad and a special "pen". The pen can be moved across the tablet to create mouse-like movements. Single tapping or double tapping the pen on the tablet is the same as single clicking and double clicking a mouse. However, if you hold the pen on the tablet in a graphics program, it's the equivalent of holding the left click button and drawing with the mouse. The difference, of course, is that you are holding a pen which allows for much more precise control. You literally can draw with the device. Wacom tablets have been popular with graphic artists for years, but if you are need of a way to draw on the screen for patient education, this is a great solution. It allows you do all the things you could do with pen and paper while keeping it all digital. 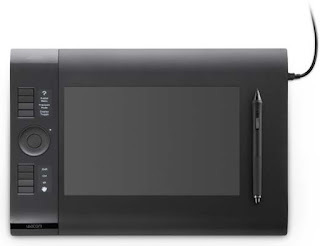 There are lots of different models, the newest being the Intuos4. The devices are available in most computer stores. For more info, visit the Wacom website. New Dean of School of Dentistry, Marsha A. Pyle, D.D.S., M.Ed. I am pleased to announce the appointment of Marsha A. Pyle, D.D.S., M.Ed., as Dean of UMKC’s School of Dentistry. Dr. Pyle is currently the Vice Dean of the School of Dental Medicine at Case Western Reserve University [CWRU], Cleveland, Ohio. Dr. Pyle will begin her duties at UMKC on August 10, 2009. At CWRU, Dr. Pyle served as Associate Dean for Education at the School of Dental Medicine and is Professor in the Department of Oral Diagnosis and Radiology. In addition to her academic work, Dr. Pyle has worked as consultant to government and corporate entities. In 2008, Ohio’s Governor Ted Strickland appointed Dr. Pyle for a three-year term to the state’s Dentist Loan Repayment Board. Dr. Pyle is a staff member at the Carl Stokes Veterans' Hospital. She has held numerous board and leadership positions on national, state and local organizations, including serving in leadership roles for both the American Dental Association and the American Dental Education Association. She currently serves on the editorial board of the Journal of the American College of Dentists. “Dr. Pyle has a strong record of academic excellence in dental education,” said Dr. Robert Piepho, Dean of UMKC’s School of Pharmacy and Chair of the Search Committee. “She is a nationally recognized leader in curricular reform and has demonstrated that she has excellent insight into a vision to take our School of Dentistry to the next level in education and research." Among her many awards, Dr. Pyle received CWRU School of Dental Medicine’s Distinguished Alumnus Award in 2008. She was also the recipient of the 2006 Presidential Citation for her contributions to the mission of the American Dental Education Association. In 2000, she received the Ohio Dental Association’s Humanitarian Award. Dr. Pyle received her B.S. in 1976 from Ashland University in Ohio. She earned her D.D.S. from CWRU in 1984 and her Certificate for General Practice Dentistry from the Veterans Administration Medical Center in 1985. Between 1989 and 1991, Dr. Pyle participated in Fellowship Training in Geriatric Dentistry at CWRU and completed her M.Ed. at Cleveland State University in 1997. From 2003 -2004, she participated in the Executive Leadership in Academic Medicine (ELAM) Fellowship Program, the nation's only in-depth program focusing on preparing senior women faculty at schools of medicine, dentistry and public health for institutional leadership positions where they can effect positive change. I extend special thanks and appreciation to Dr. Nancy Mills, who has been serving as Interim Dean of the School of Dentistry and will continue in that capacity until Dr. Pyle’s arrival. Dr. Mills’ long history of administrative service and extensive knowledge of UMKC’s health science schools have been invaluable to the university during this transition period. I also commend the work of Dean Robert Piepho and the Search Committee for helping to select an outstanding Dean of the School of Dentistry from an extremely competitive slate of candidates. Dr. Pyle’s appointment coincides with the recent $8.2 million legacy estate gift to our School of Dentistry, the largest in the dental school’s history. With her strong commitment to education and service to the community, Dr. Pyle’s career reflects the historic mission of the school, which graduates 66% of Missouri’s dentists and provides $5.5 million in free and reduced health care to more than 60,000 patients annually. Please join me in welcoming Dr. Marsha Pyle to UMKC. For more information about our new Dean of the School of Dentistry visit http://www.umkc.edu/news/SchoolofDentistry_DeanAnnouncement.asp. WATERTOWN, MA: April 2, 2009— Pulpdent Corporation has released Kleer-Veneer™ Light-Cure Veneer Cement, the first invisible veneer cement. Kleer-Veneer is also available in opaque shades. Kleer-Veneer is a unique, moisture tolerant, self-adhesive veneer cement. No bonding agents or silane are required. The distinctive consistency holds the veneer securely in place without drift before light curing. Kleer-Veneer is available in clear, opaque white, opaque cream, and opaque pink. The clear cement is invisible and does not alter tooth shade. The opaque shades can be used when neutralizing existing tooth color is desired. 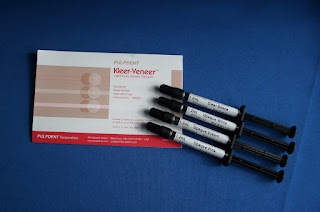 The Kleer-Veneer intro kit contains four 1.2ml syringes, one of each shade, plus 20 applicator tips. Refills contain one 1.2ml syringe Kleer-Veneer plus 10 applicator tips. When Amazon originally released the Kindle ebook reader, one of the really amazing things about it was its wireless connectivity to what Amazon called "Whispernet". The device has a built-in cell phone transmitter that connects to a high speed data connection at no additional charge. This connection allows the Kindle user to connect to Amazon's Kindle store to browse and buy books. Once purchased, the books are downloaded in the background (and they arrive quickly). Shortly after the Kindle was available, it was leaked that the Whispernet connection is actually made over the Sprint EvDO Rev A network. This means the Kindle is actually a device with wireless broadband capability. Now an article in the Wall Street Journal states Sprint is looking for similar partnerships with Garmin, Sandisk, and Kodak. This is an interesting idea since lots of devices would certainly benefit from being wirelessly connected to the 'net all the time. This takes on a really great idea when you consider that the Kindle provides the service as part of the purchase price. I'd be more than willing to pay more up front cost for a device with an always on connection. Hopefully this is the start of something good and we'll see more of this in the not too distant future.